Some of Britain's biggest companies have been warned the "game is changing" when it comes to investing in Zimbabwe. Foreign office minister Lord Malloch Brown told firms such as BP, Barclays and Tesco they would find it harder to operate there as sanctions tightened. He also urged MPs with shares in such companies to "look very carefully at their investment portfolios". Robert Mugabe is to be sworn in as the President of Zimbabwe after an election in which he was the only candidate. 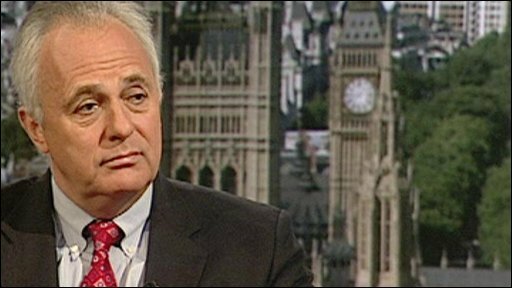 Lord Malloch Brown is flying to Egypt to join an African Union meeting which will discuss the election. He said there were "practical difficulties" for Britain in responding to an Italian call to shut embassies in Harare, because of the 14,000 British citizens currently in Zimbabwe. But he said all measures were being considered including tougher economic sanctions. "You start with political and economic pressures and you work up through the repertoire, but what you cannot accept is the status quo continuing. President Mugabe has to go," he told BBC1's Andrew Marr show. Asked what this meant for British firms, he said: "These companies until now have been in the law as it currently stands, they shouldn't get the opprobrium for having somehow breached the law or been sanctions-busting. "The actions didn't govern the activities they were involved in. "But now the game is changing. Now, as I've said, everything is on the table and I think you will see, initially, not just deepened measures against these individuals who surround Mugabe, to hit their global wealth wherever it is. "But you will see measures against companies, international companies that trade with government entities, have government bank accounts. "I think all of these British and other companies will find that actually the knot is tightening and that a lot of activities they can do until now, they won't be able to do going forward." Asked about British MPs with investments in Zimbabwe, he said that up until now they had done nothing wrong "we are going to move the goalposts". "I think they, as a matter of conscience and, frankly, political good judgement are going to want to look carefully at their investment portfolios," he added. Seven MPs, including shadow home secretary Dominic Grieve, have investments in Zimbabwe, according to The Independent on Sunday. Mr Grieve owns at least £240,000 worth of shares in companies operating in the southern African country such as Shell, mining firms Rio Tinto and Anglo American and the Standard Chartered bank. Defending his position, Mr Grieve said: "The Conservative Party has made it clear that companies operating in Zimbabwe must adhere to the highest ethical standards and I fully endorse that view." Other firms operating in Zimbabwe in which MPs have shares are Barclays, BP and Tesco. Shadow transport minister Robert Goodwill, who was also one of the named MPs, told the Independent on Sunday he "did not feel particularly proud to be a Barclays shareholder". Mr Goodwill said it was better to bring pressure to bear as a shareholder but added that it was "not a very good time" to sell the shares. Meanwhile shadow business minister Jonathan Djanogly, who owns shares in Barclays, BP, Shell and Tesco, said shareholders "should be encouraged to make representations". Totnes Tory MP Anthony Steen said he was unaware of the Zimbabwe links to his investments in Unilever and Shell. The other MPs listed were Tories Tim Boswell (Barclays and Tesco) and Sir John Stanley (Shell) and Liberal Democrat MP Sir Robert Smith (Rio Tinto and Shell). Conservative leader David Cameron has previously called on Zimbabwe investors to "examine their own responsibilities". Speaking last week, he warned that businesses and individuals "must not make investments that prop up the regime".